Do you ever wonder what the world was like before the advent of social media? How did people live or even cope before the likes of Twitter, Facebook and Instagram? What was it like to live in a world where likes and comments didn't matter? What did people do when they wore a nice outfit or had a lot to say? I guess they lived, huh? Although every advancement comes with both the good and bad, one has to wonder, "has social media done more harm than good?" 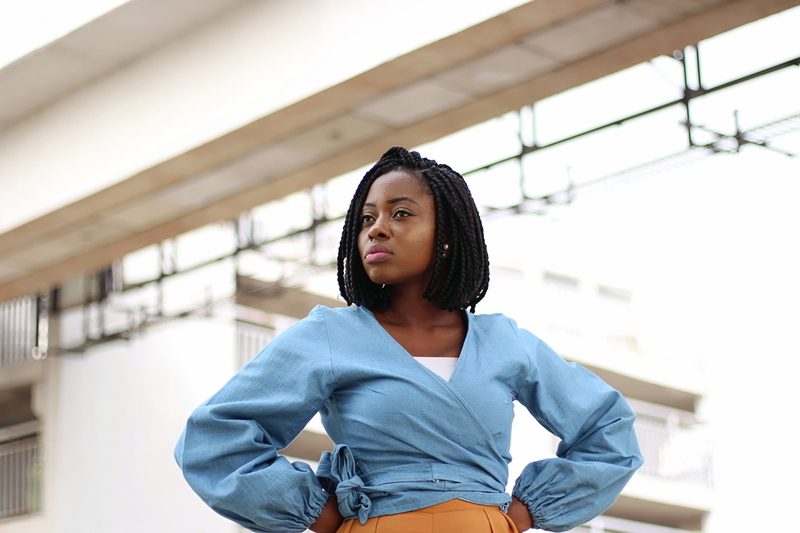 While on one hand, it has offered greater exposure, more opportunities to connect globally, increased knowledge and even jobs like mine (social media manager), but are the negatives outweighing the positives? We've heard of cases of people putting up appearance and living fake lives as in the case of #Visababe, a blogger who is trending across social media. For those who are not aware, the blogger who portrays a luxurious lifestyle is pleading for visa funds to prevent her from being deported from the UK. While I understand where she's coming from, as in life and this creative industry, the more money you spend, the more opportunities and collaborations one can get, I'm not saying it's okay. And it's so easy to get carried away with that fake life while people looking in from the outside compare. Because it's easy to rate our lives based on the highlights of others. Social media has made a lot of us fall into the comparison trap ( I've been guilty too). The truth is, social media is not always a true reflection of a person's reality, one just has to remember not to get caught up. 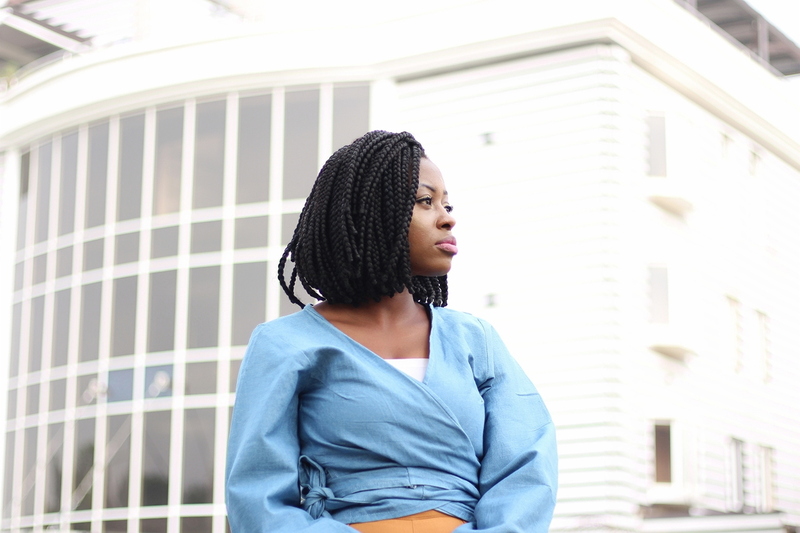 I've finally joined the bandwagon with this denim wrap top made by blogger Esther of The petite, remember our collab here? 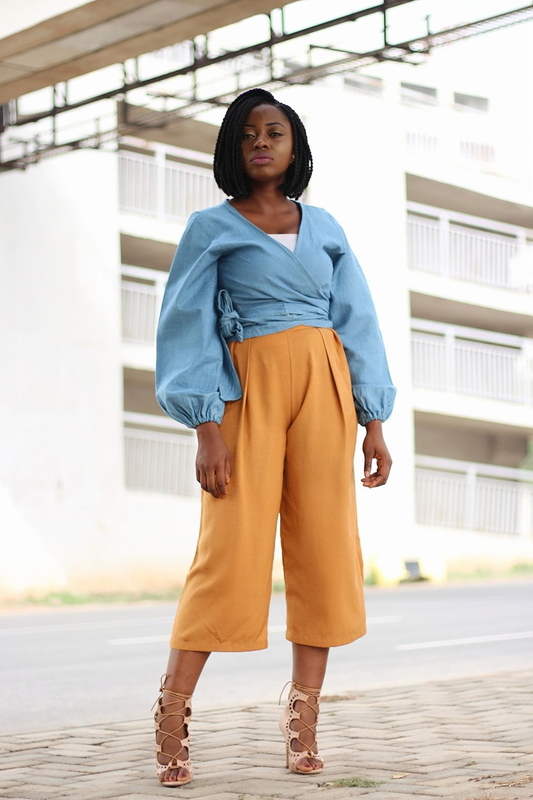 I paired my top with culottes styled here. 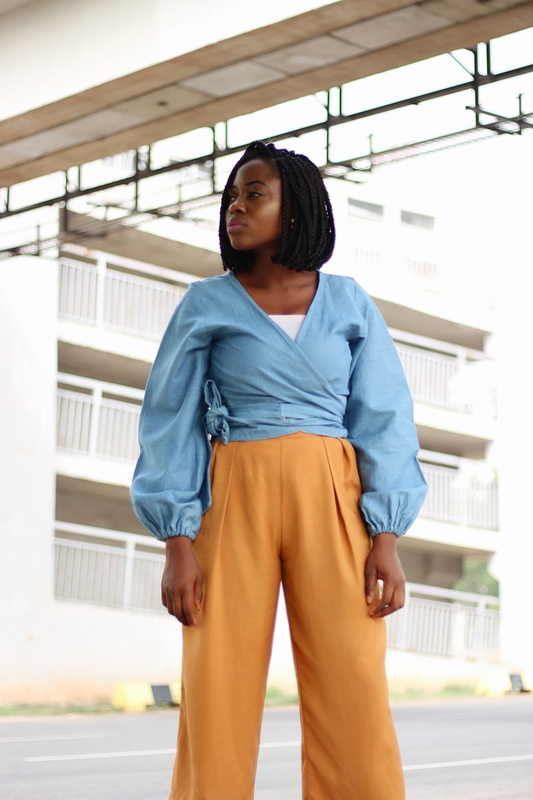 The top costs only 6k, the fit is amazing, I especially love the sleeves and cropped look of the top. However, I do wish the rope was a bit shorter, I struggled with hiding the excess. Overall, I'm impressed and look forward to restyling this top. Has social media done more harm than good? Have you ever fallen into the comparison trap? How did you cope? What are your thoughts on the #visababe situation? Don't forget to enter my GIVEAWAY for a pair of shoes of your choice. @Hungwa Esther, lol definitely extra indeed, a balance must be found though. Thank you so much and of course you're most welcome. Thank you so much for reading and contributing Olaa. I'm really trying to remember that bible verse on contentment but really we save ourselves a lot of stress when we remain thankful for what we have/where we are while working towards better. Social media really can go both ways depending on how we go about it. I want to believe it has done more good than harm but different people just see it their way and use as they see and feel......i fell into the comparison trap when I joined I.G newly last year and I would apply for jobs and not get because I didn't have a blog or enough I.g followers even tho my ideas were great, I legit became depressed and even started trying to buy things I could not afford because I was trying to please the people I wanted to work with, i just thought hard and long one day I decided to start from scratch and trust the slow process. I'm honestly indifferent about the whole #visabae issue I'm just happy she had the courage to finally speak out hopefully people see and learn from her instead of bashing her. I love this outfit tho and nice write up too. I too fell into that trap but had to snap out of it when I realized that I'm spending money I don't have to impress people who don't care. As the bible said, contentment is great gain and indeed it is. I agree, visabe is a learning experience more than anything. Thank you for reading. I heard of the story but I think we can understand the struggle to an extent. I decided not to be that person. I'm the —not so — regular girl, I want to teach regular girls how to look good with what little they have. But I can understand the pressure she felt, plus collaborations with brands helped up her lifestyle. Like you said, let's not be carried away by social media. Wo, this social media issue is doing so much harm than the good it brings if you ask me. This case of the #visababe is just one out of hundreds of thousands and is trending because of her acclaimed popularity. What about the others unheard of? The life's it has claimed, damaged or even destroyed utterly? My advice is for everyone to just be careful cos the Bible has said we should do everything in moderation. I often struggle with comparison. I find myself looking at other bloggers and wondering what I have to do to get to where they seemingly are. Most times, I have to consciously shake myself out of that place. But luckily for me, I've been able to find a balance between looking up to them and still not compromising on my values to be like them. So, while I may let them inspire me, I do not necessarily let them dictate how my life should be. I buy only the things I like and can afford and not the things that I feel I need to buy because A or B did. It's hard but I try to stay grounded. Also, I know too well that social media is never the accurate representation of how one's life is. Everyone puts their best forward whether consciously or unconsciously so trying to live up to such standards will be setting yourself up for an epic fail. Nice combo! I want that topppppppp! You look amazing and I love the blouse! I totally agreed with what you have said. For you to get noticed and increase stats and be approachable, at times you have to make deep sacrifices. If you do not invest in clothes and accessories and all of that, why are you a fashion blogger, but one must not get carried away and forget his/her true values. You have to prioritise! It's not always easy though but we must remember to not get caught up. And you're quite right, I believe that question has a subjective answer. Thank you and for reading and commenting. social media has done more harms than good to our society. I hope our people will change when they are more mature..